Golden age. See pics for condition. Superman Comic Annual 1952 Atlas GD. A GD example. Poor (PR) - Fair (FR) - Good (GD) - Very Good (VG) - Fine (FN) - Very Fine (VFN) - Near Mint (NM). JINGLE JANGLE COMICS (1942-1949) #14. FR (Fair) condition, a LOW GRADE copy. FN - Fine - minor foxing, spine stress, minor edge wear, cover crease, small rip on rear cover, pencil 'R' on cover - see pictures. Publication Year: March - April, 1953. Issue Number: No. 63. Comics Identifiers . Publication Year: May - June, 1953. Issue Number: No. 64. Comics Identifiers - I obtained this comic from relative after helping them clean out their house. Superman # 95 The Practical Joker ! CBCS 3.0 scarce Golden Age book ! Would make an excellent addition to your collection. 1 x Original envelope. Action Comics # 89 Classic Rainbow cover ! 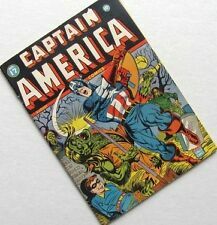 CBCS 1.8 rare Golden Age book ! Action Comics # 95 The Prankster Laughs ! CBCS 4.5 scarce Golden Age book ! World's Finest Comics # 32 Superman Batman ! CBCS 2.0 scarce Golden Age book ! 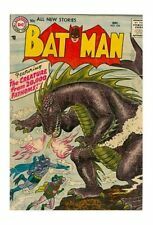 Detective Comics # 199 The Invisible Batman ! CBCS 3.0 scarce Golden Age book ! CONDITION: GD/VG (3.0) SMALL "CHEW" LOWER RIGHT CORNER. Luke Short's Bounty Guns #17 and Top Gun #24 (1950s/60s) (-JB-) FR GD From the Jim Baikie Collection. Bounty Guns #17 - FR with pen to cover. Poor (PR) - Fair (FR) - Good (GD) - Very Good (VG) - Fine (FN) - Very Fine (VFN) - Near Mint (NM). INCLUDES WORK BY ORLANDO AND THE GREAT WALLY WOOD. CAPTAIN SCIENCE. 10 CENT ISSUE. LO W STARTING PRICE. 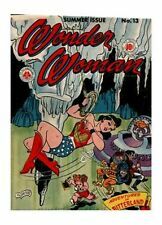 World’s Finest comics # 31 Please check out my other items for more Golden age and Silver age comics. I am selling some of our collection. I am not a professional grader. Please refer to the pictures for condition. As you can see from the picture the comic is in very nice condition. The comic will be carefully packed with cardboard protection on shipping. There is a light amount of tape on the spine of the comic and a small tear on 3 of the pages (1cm - 2cm). I combine shipping. Just drop me a line on the items and I will send an invoice. Thanks! THE HAUNT OF FEAR #26. GRADING: Grading can be subjective so our grades may not necessarily match up exactly with yours. We understand that clearly. If you disagree with our grade, we respect that. Flying Saucers Comics # 1 Monsters or Benefactors grade 2.0 scarce Avon book ! UP FOR SALE CAPTAIN MARVEL ADVENTURES #27 IN GOOD/VERY GOOD CONDITION COVER DETACHED FROM STAPLE WITH NICE INTERIOR PAGES 100% COMPLETE. SCANS/PICTURES IS OF THE ACTUAL COMIC THAT IS UP FOR SALE. Horrific # 11 Classic Devil Cover ! grade 1.8 scarce Comic Media book ! Horrific # 11 Classic Devil Cover ! Release Date is unknown not shown but believed to be 1964. (BRITISH Comic). Very Good (VG) 4.0. High Seas Colour Comic (1951) (-JB-) GD/VG From the Jim Baikie Collection. Poor (PR) - Fair (FR) - Good (GD) - Very Good (VG) - Fine (FN) - Very Fine (VFN) - Near Mint (NM). He was a very well-respected contributor to girl's titles, starting work in 1966 for Valentine and later in Lady Penelope, June and School Friend, Jinty, Sandie and Tammy. 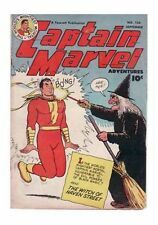 Captain Marvel Adventures 52 VF+ 1946 Origin & 1st app Silvana Nice Copy! Listed for sale is; Captain Marvel Adventures #52 VF 1946 £195.00 Nice copy! (All complete no missing pages or tape). You will start to see them appear monthly on our new arrivals page so don't miss out! JINGLE JANGLE COMICS (1942-1949) #22. GD (Good) condition, a LOW GRADE copy. NO MAJOR FAULTS, VERY GOOD COND. WILL COMBINE. Published 1948 by Marvel. The "A" variant has a June 1948 publication date. Grade: VG 4.5. of comics, generally about 25-40 comics depending on page count. Item images. Menace # 9 Take a Walk with the Walking Dead ! grade 5.5 scarce Atlas book ! Grade 5.5 scarce Atlas book ! Four Color #13 - CBCS 6.0 FN - Dell 1941 -Reluctant Dragon- Mickey & Donald!!! Reluctant Dragon! Mickey Mouse, Donald Duck and Goofy backup stories! HIGHEST GRADE on The Census! Beautiful CBCS 6.0 (FN) example - Off/White to WhitePages with Excellent Gloss quality! "Reluctant Dragon!". Action Comics # 61 Classic Superman cover ! CGC 3.0 rare Golden Age book ! Shock SuspenStories #7. Electrocution Cover. Moderate amount of tape on cover and intertior. Off-White/White Pages. Can't find what you're looking for?. Shocking Mystery Cases # 55 Return From Death ! grade 1.5 scarce book ! In addition toThe Avengers, early issues also featured Marvel's master of the mystic arts,Doctor Strange. From issue #28Master of Kung Fu was added, alternating in later issues withIron Fist. With issue #95,The Avengers comic absorbed the failedSavage Sword of Conan weekly. Fantastic Fears # 9 Horror Runs Amuck ! grade 5.5 scarce Ajax book ! 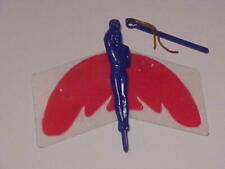 For sale is the Plastic Man Archives Vol. 4 from DC Comics, collecting classic Golden Age stories from Police Comics # 40-49 and Plastic Man # 3, by Jack Cole. Hand of Fate # 20 Could that Elephant come to Life ? grade 3.5 scarce Ace book ! Grade 3.5 scarce Ace book ! Superboy # 80 1st Meeting of Superboy & Supergirl ! CGC 5.0 scarce book ! CGC 5.0 scarce book ! Grade isCGC 5.0 . Horrific # 12 Classic Alien Cover ! grade 4.0 scarce Comic Media book ! Horrific # 12 Classic Alien Cover !